We interrupt "A Fashion Story" today for a gift guide! I figured you might need a little break from all those text-intensive posts for a few days. So, for the weekend, we'll be back to the gift guides. However, on Monday, the fashion story shall return! Today's gift guide is one for your favorite college girl - or any student, really. So, let's get this party started! I think these are more "glitter pens" than metallic ones. I love them. They're fun for any kind of writing. You might want to get yourself a set while you're ordering. I know, I know. I've already used this item in a gift guide, but I used it in black. But it's a good gift! If college students are still pretty much the same as they were when I was in college, they still love taking photos. Hard copies are a super fun novelty, especially at parties! These are a little pricey, but I own them, and I absolutely love them. These are so comfortable for both walking and driving. The flexible soles make them feel like being barefoot...but better. 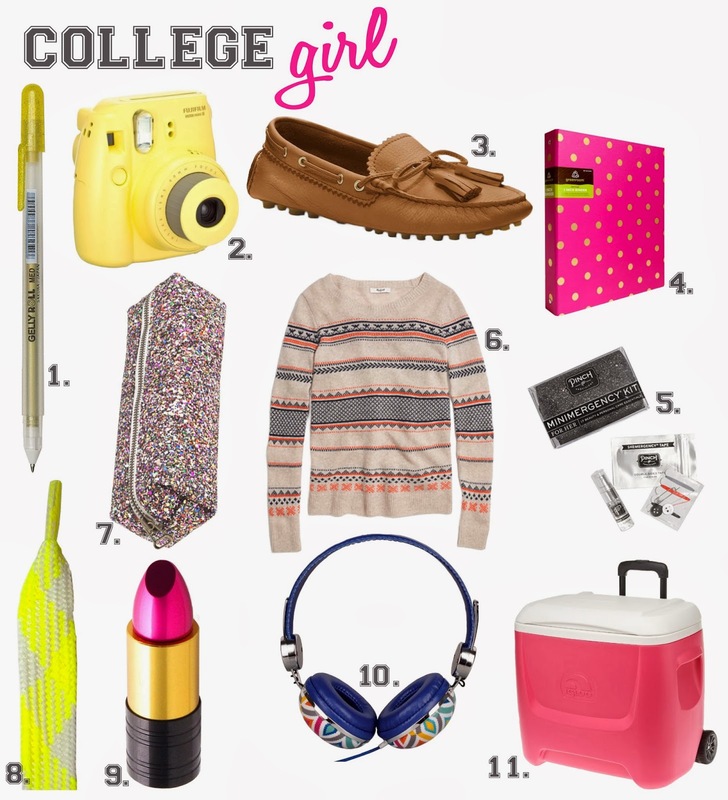 These are great for the girl who lives on a pedestrian campus. Super cute, and it comes in different colors! Every class needs a notebook. Why not make it a cute one? This is great as a gift or small enough to be a stocking stuffer. It's got everything you might need if you find yourself, well, in a pinch! Bonus: It comes in a little black glitter pouch. This sweater is just cute and easy. Great for jeans, probably great with a black skirt. I can see this becoming a quick wardrobe staple. It also comes in Grey. So, it says it's for girls, but pencils are always the same size. The multi glitter makes it a super fun way for your college girl to carry all her glitter pens, pencils, and highlighters. this is an excellent stocking stuffer. The price is right, and it's great for the girl who likes to wear sneakers. It's an especially good idea for girls who like to get their gym time on. I meannnnn...is there a cuter way to store all those papers you're writing and all those websites you're designing? I think not. This will fit nicely in that glitter pencil case. I got my first ipod when I was in college. That's right, i went to college before iphones even existed. Now, though, since everyone's always got their music with them right there on their phone, why not have some cute head phones? These are great for canceling out all that chatter in the library or just enjoying some good tunes while you walk to class. If your college girl is anything like I was, she likes the tailgating and the halftime show way more than she'll ever even care about the game. So, why not have a cute pink rolling cooler? She doesn't even have to go into the game if she doesn't want to. She can just enjoy all the treats she brought while sitting in the parking lot. Stay tuned tomorrow for yet another holiday gift guide!